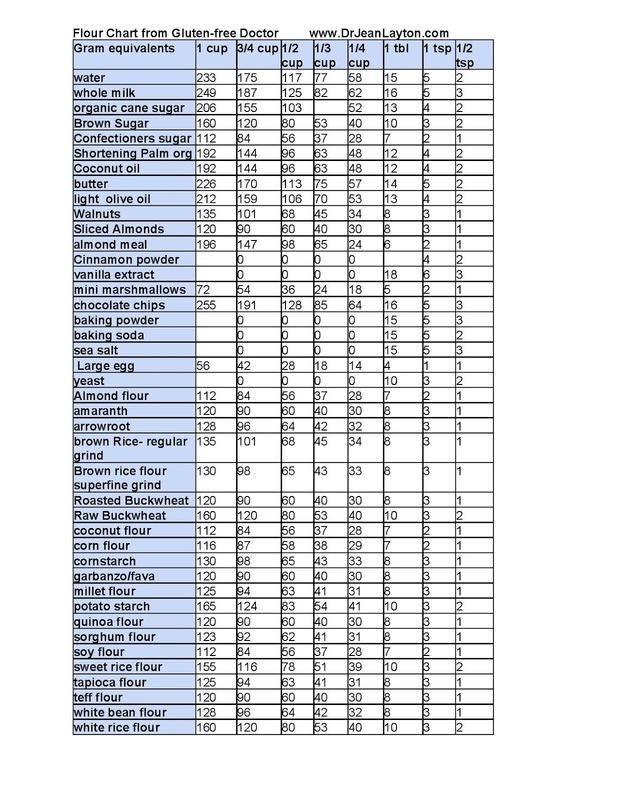 one desire I had was to write all of the recipes in weight measurements for accuracy and reproducibility. When you weigh your ingredients, you get the same results every time. Consider it a harkening back to my chef days. After all, in gluten-free baking, we are talking about the difference of tablespoons of flour extra or missing based on flour grind. A really powdery consistency will encompass far more flour in a cup than a coarse grind. I know. That means you have to own a scale, and a conversion chart. Believe me, for the sake of accuracy of recipes that actually work, every time, it is worth it. Scales are a pretty minor investment in accuracy. And if you are like me, hating to create a sink full of dishes to make one recipe, you will really love weighing. By zeroing out the scale between measurements, you can keep scoops in your flour mixtures and never have to wash a measuring cup again. 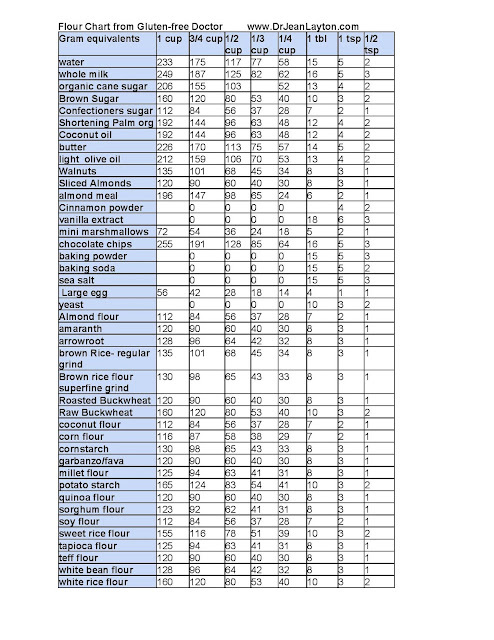 To create this chart, all of the flours I weighed are from Bob’s Red Mill. They are accessible, from a dedicated gluten-free facility and fairly local for me. Feel free to gather flours from other mills, just realize that the grind of flour makes a huge difference in the cup measurement, but by weight the recipe will work. My book used weight measurements only for the flours only, but I love to weigh all the ingredients, zeroing out and dispensing right from the bottle or container. Your personal flours might be a different weight per volume measurement. If you use mine, take notes to see whether it is perfect in your eyes or needs just a bit of a tweak. Feel free to share this with all your friends. If you use it on your site as a reference, please let me know in the comments. I love to chat with other weighties.